Duffus is a small village in the Moray region, a lively market town around the River Lossie dating back to the thirteenth century. The name of DUFFUS derives from the lands of DUFFUS in Morayshire, Scotland. The present DUFFUS PARISH lies in the the lands of the ancient BARONY OF DUFFUS an area of 9,565 acres. At one time, the region was below sea-level and the Loch of Spynie and stagnant pools of water were a conspicuous feature of the area. Duffus has consecutively won countless awards, including "Best Kept small village in the North of Scotland". There are still some old village houses here. Duffus Castle is located a mile and a half east of Duffus village, off the B 9012 at Old Duffus, 40 miles north-east of Inverness on the A96-B9089. Located 5 miles north-west of Elgin in Moray on the east coast of Scotland. This typical Norman castle was built in the 14th century on the site of an earlier wooden construction. 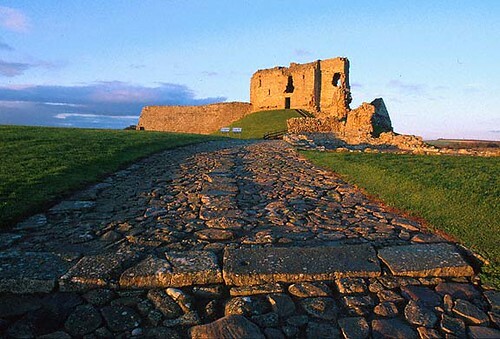 Today you can walk across the cobbled causeway and explore the stone ruins. It is in the care of Historic Scotland.